Christ Church is an Episcopal church in the Old City neighborhood of Philadelphia. Founded in 1695 as a parish of the Church of England, it played an integral role in the founding of the Protestant Episcopal Church in the United States. In 1785, its rector, William White, became the first Presiding Bishop of the Episcopal Church. From 1754 to 1810, the church's 196-foot (60 m.) tower and steeple was the tallest structure in what is now the United States of America. Christ Church was founded in 1695 by members of the Church of England, who built a small wooden church on the site by the next year. When the congregation outgrew this structure some twenty years later, they decided to erect a new church, the most sumptuous in the colonies. The main body of the church was constructed between 1727 and 1744, and the steeple was added in 1754, making it the tallest building in North America at the time, at 60 meters. Christ Church is considered one of the nation's most beautiful surviving 18th-century structures, a monument to colonial craftsmanship and a handsome example of Georgian architecture. Modeled on the work in London of Christopher Wren, it features a symmetrical, classical façade with arched windows and a simple yet elegant interior with fluted columns and wooden pews. Although the architect of the church is unknown, its construction was supervised by John Kearsley, a physician, who was likely also responsible for the design, possibly with John Harrison. The church was rebuilt in 1777 by Robert Smith, and the interior was altered in 1883 by Thomas U. Walter. The baptismal font in which William Penn was baptized is still in use at Christ Church; it was sent to Philadelphia in 1697 from All Hallows-by-the-Tower in London. Another baptismal font and the communion table were crafted by Philadelphia cabinetmaker Jonathan Gostelowe, who served on the vestry in the 1790s. Christ Church's congregation included 15 signers of the Declaration of Independence. 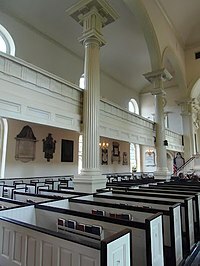 American Revolutionary War leaders who attended Christ Church include George Washington, Robert Morris, Benjamin Franklin and Betsy Ross (after she had been read out of the Quaker meeting house to which she belonged for marrying John Ross, son of an assistant rector at Christ Church). Brass plaques mark the pews where these individuals once sat. At the convening of the First Continental Congress in September 1774, Rector Jacob Duché was summoned to Carpenters' Hall to lead the opening prayers. During the war, the Reverend William White (1748–1836), rector of Christ Church, served as Chaplain to both the Continental Congress and the United States Senate. In September 1785, clerical and lay deputies from several states met in Christ Church and organized as a general convention, of which White was chosen president. He prepared a draft constitution for the church as well as an address to the archbishops and bishops of the Church of England, asking for the episcopate at their hands. White was also largely responsible for the liturgy and offices of the first American Book of Common Prayer (published 1789), which were to be submitted to Church of England authorities. At the convention of the Diocese of Pennsylvania in 1786, he was elected its first bishop and sailed for England with Dr. Samuel Provoost of New York, seeking consecration. After passage of a special enabling act by Parliament, White and Provoost were consecrated in early 1787 by the archbishops of Canterbury and York. Bishop White returned to Philadelphia that Easter Sunday. In 1789, under White's direction, the first meeting of the House of Bishops was held at Christ Church, marking the first true General Convention of the Episcopal Church in the United States of America. White was the first Episcopal Bishop of Pennsylvania and served the congregations of Christ Church and St. Peter's Church for decades. White is buried in the church's chancel. Christ Church is a National Historic Landmark and a unique historic site that continues its original function as an Episcopal parish. More than 250,000 tourists visit the church each year. General John Forbes (1710–1759), British commander during the French and Indian War, who captured Fort Duquesne and named the city of Pittsburgh. Andrew Hamilton (1676–1741), lawyer known as "The Philadelphia Lawyer"
Many other notable people are buried at nearby associated Christ Church Burial Ground including Benjamin Franklin and four other signers of the United States Declaration of Independence. 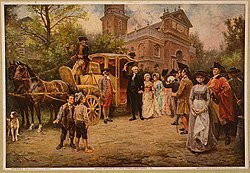 General Washington at Christ Church (c.1908) by J.L.G. Ferris. Plate 15 from Birch's Views of Philadelphia (1800). 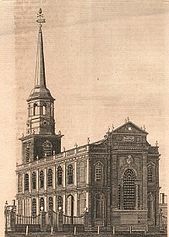 Christ Church, Philadelphia (1811) by William Strickland. Interior from balcony (c. 1883). Christ Church Interior (c. 1914) by Joseph Pennell. Gostelowe's baptismal font is in the foreground. Interior from balcony (c. 1960). John Inglis baptised here in September 1744. ^ A historical account of Christ Church, Philadelphia, by Benjamin Dorr, Swords, Stanford & Co., N.Y., 1841. ^ a b c d e f g "Christ Church Burial Grounds: Notable-burials". www.christchurchphila.org. Philadelphia, Pennsylvania: Christ Church. Retrieved June 5, 2018. 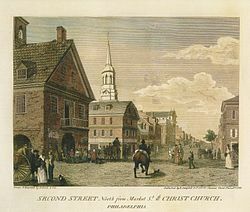 Wikimedia Commons has media related to Christ Church, Philadelphia.